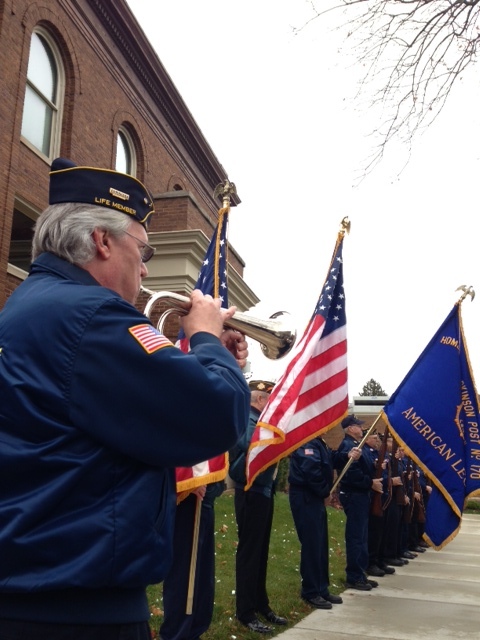 Veteran’s Day was commemorated today on High Street at 11:00 a.m. in a short but sweet ceremony. 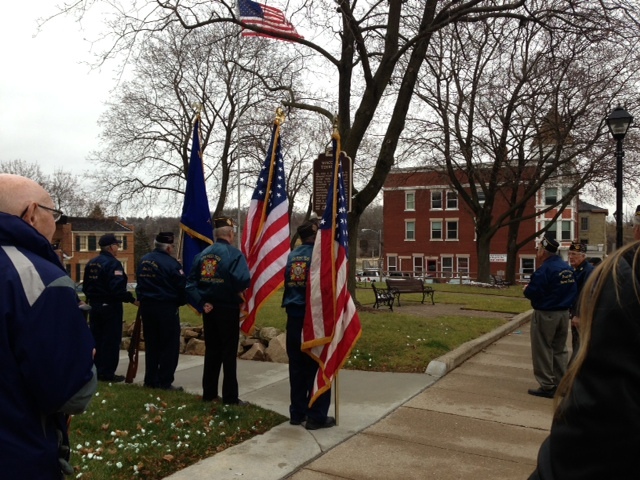 In Mineral Point, Veteran’s Day is not a day off from school; it’s a day to remember and give thanks. The American Legion was at the Middle School this morning, and this afternoon veterans will head to the Elementary School for the traditional Veteran’s Day assembly. The fifth graders have written over 200 letters to area veterans inviting them to attend. The American Legion will open the ceremony by marching in the flag. The veterans will line the perimeter of the gym, and one by one they will state their name, which branch of the service they were in and, where they served. The students honor the veterans with songs and poems. After the colors are retired, the veterans assemble near the doorway, and as the students leave, they shake the hands of each veteran, and thank them for their service. This Elementary School Veteran’s Day Program is scheduled for today at 2:00 p.m. This entry was posted in Traditions and tagged The American Legion, Veterans Day. Bookmark the permalink. Wonderful Ceremony at the High/Middle School this morning. Looking forward the banquet at the VFW tonight to continue honoring our Vets! Pastor Melcher announced this would be his last year giving the address at the ceremony. He will truly be missed!! He has done this address for the last 18 years. What a wonderful way to honor veterans! Thanks, Mineral Point Schools!